How to Integrate Using Inverse Trigonometric Functions? The following diagrams show some examples of Integration Rules that involve Inverse Trigonometric Functions. Scroll down the page for more examples and solutions on how to integrate using inverse trigonometric functions. How to integrate involving inverse trigonometric functions? 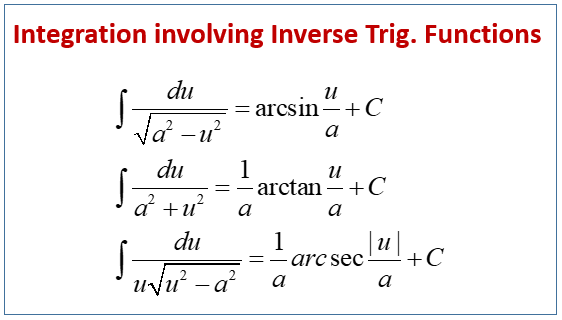 How to apply the integrations rules involving inverse trigonometric function? This video gives two formulas and shows how to solve a problem with a bit of algebra and a u-substitution. This video gives two formulas and shows how to solve a definite integral using u-substitution and the formulas.